Architects are frequently hounded by the task of area tracking as they practice in the real functional and economic world. Early in design, the person drawing the design establishes, quantifies, parses, analyses, sorts, and re-sorts areas describing each function needed in a building. How to areas fit to opportunities for form? How can and should areas be grouped, consolidated, separated? And, of course, the bottom line, what area fits the budget? Building Information modeling is the ultimate tool to make this tracking work. In past, drawings in the schematic design phase were famous for fudging the area numbers. How else could the Architect draw up a guiding strategy as fast as the thought process, and arrive at the basic outline of the building plan? Design ideas come quickly, accurate accounting less so. The more complete the numbers, the more likely, with so much time invested in computation, that the plan becomes established and inflexible. Hand sketched schematics require setting a scale to plan, and punching length and width into calculator. CAD improved the situation somewhat, with the ability to surround areas with a polyline that listed area. Facilities management programs can attach these areas to reports, but require extra steps not integrated into the design process as a whole. Number crunching in Revit is straightforward, as shown in the Revit Wiki and the Revit Zone websites, citing two sources. A building information model, as it is created in Revit, is at once a geometric, graphic and numerical data base. 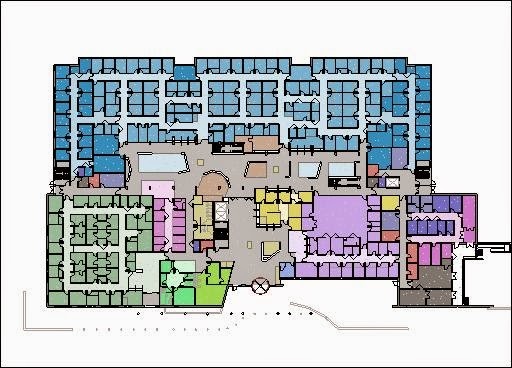 On the plan level, a room is reported graphically bounded by walls or area separation lines. This room can also be reported by any other of its properties, including its area, assigned department, occupancy, function, or anything else. These properties can be sorted and reported in tables (like an excel spreadsheet), or in color coded plans alike. 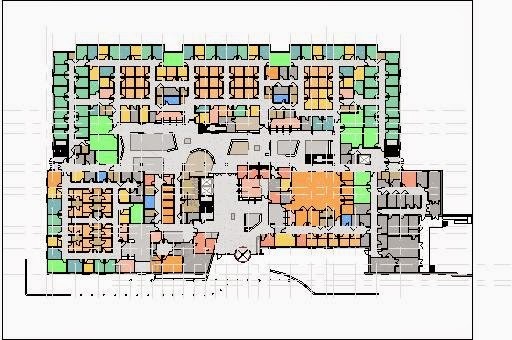 The multi-clinic medical center shown is one example of design area tracking in Revit. When rooms are sorted by contribution to net area, the Architect can verify alignment to the user's program needs as a whole. Using a ratio with gross area, the architect can test the efficiency of the proposed plan layout. We can flexibly nudge walls, add, subtract, consolidate, rearrange, and test the patterns: numerical feedback is immediate. The graphics give us a clear picture of what is being accomplished, and may point out new directions. 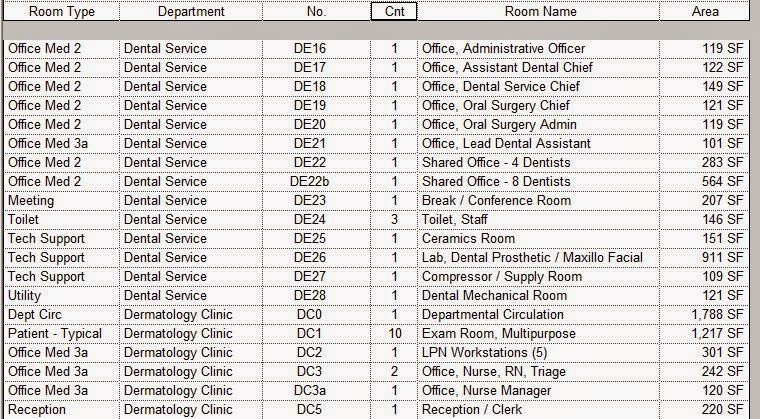 Using the clinic center as an example, other properties can be assigned and tracked. The designer as well as the building end user will want to see where individual clinics and their supporting services are proposed. The visual report in plan is immediate and convincing. Drilling down yet further, we can see how sub-functions relate: private or public, served or served or serving. Exam rooms and individual offices are the basic building blocks of this particular building program. 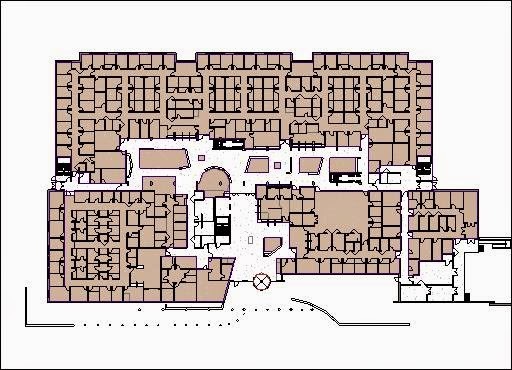 Lobbies, corridors, labs, toilets, and other functions serve these in the larger hierarchy of spaces. These properties appear in tabulated, sort-able lists, and also can be tested and visualized with color coding in plan. Many see the power of modeling for three dimensions early in the design process. The model in Revit certainly provides this, as do many other software modeling packages like Sketch-up and 3dMax. Less tapped is the modeling of area early in planning, This requires a true integrated building information modeler like Revit.